After a long year of waiting, Avengers: Endgame is just days away from arriving in theaters. Moviegoers are eager to jump back into the MCU, and see how the galaxy is recovering after losing half of all life. Infinity War shocked fans by killing off a ton of characters, with the upcoming movie reportedly focusing on the survivors. From the Guardians of the Galaxy, the only ones left are Nebula and Rocket. Well, this is an interesting peek behind the curtain. Because while Sean Gunn and Marvel Studios have Rocket’s motion capture work down to a science, the kinks weren’t worked out prior to filming the first Guardians of the Galaxy movie. And Gunn’s willingness to use his body and transform into Rocket on set is part of the reason why the CGI character seems so real. Standing in for Rocket during rehearsals and filming might seem like a thankless job, but Sean Gunn has another role in the Guardians of the Galaxy franchise. He also plays Ravager Kraglin, one of Yondu’s closest buddies. Of course, Kraglin hasn’t been included in Infinity War and Endgame, so Gunn has an under the radar part in those massive ensemble projects. Sean Gunn might not be voicing Rocket, but he has just as much ownership over the character. Since he’s the one inhabiting the fan favorite Guardian during all of his scenes, he’s spent more time with Rocket than Bradley Cooper. Cooper’s voice performance is stunning, but someone needs to be on set to act along Rocket’s scene partners. Enter Mr. Gunn. 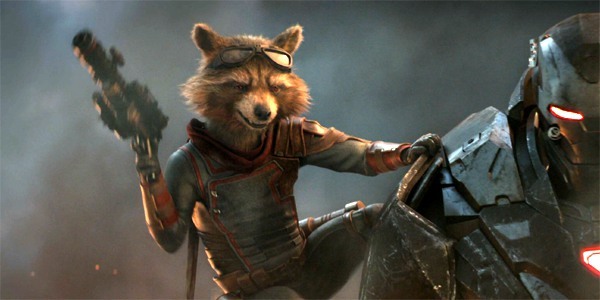 Rocket is one of the survivors of Thanos’ snap (aka The Decimation), so he should presumably have a meaty role in Avengers: Endgame. The Russo Brothers keeping Rocket and Nebula alive is an inspiring creative choice, as they’re the most damaged members of the Guardians. The apocalypse may just force them together, and hopefully change their dynamic in Guardians of the Galaxy Vol. 3. Sean Gunn’s work as Rocket can be seen when Avengers: Endgame arrives in theaters on April 26th. In the meantime, fill out CinemaBlend’s Endgame death pool, and check out our 2019 release list to plan your next trip to the movies.